We’re heading into the winter with a Blizzard Fest! As the days become shorter and autumn approaches, it’s only natural to set our minds to interior activities, meditative ruminations, and paperwork. Yes, paperwork…as in folding paper! 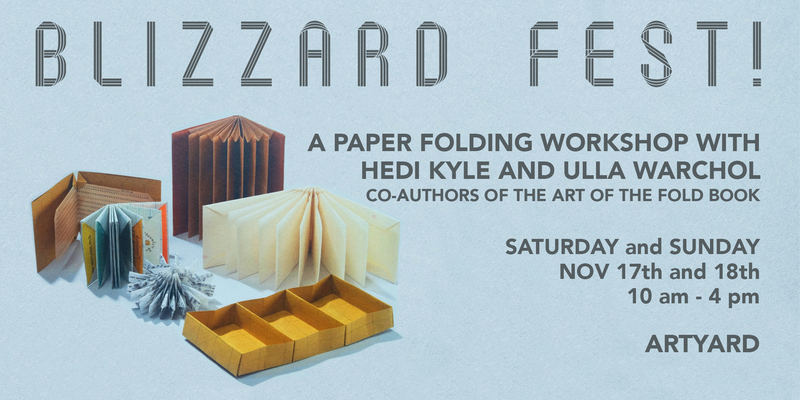 Renowned book artist Hedi Kyle teaches a two-day workshop celebrating the cooler temperatures with her Blizzard structures. This family of books, boxes, cards, and objects are all folded from single sheets of paper using the mechanism of the fold to interlock and create three-dimensional structures that bind themselves. Learn to make books that require no sewing or adhesives. Folding enthusiasts of all levels are welcome. (Age 13 and up). This workshop will take place at ArtYard Saturday and Sunday, Nov 17th and 18th, 10 am – 4 pm. This workshop has limited space so sign up early. Hedi Kyle is known as a pioneer and innovator in the field of book arts. She has developed many unique structures and as an adjunct professor of bookbinding in the Graduate Program of Book Arts and Printmaking, University of the Arts, Philadelphia, she trained and mentored several generations of book artists. Most recently she co-authored The Art of the Fold, a step-by-step guide of 40 of her most well-known structures, with her daughter Ulla Warchol who will be assisting her in the workshop. The $250 is for the entire workshop, which includes both days Saturday and Sunday, Nov 17th and 18th. Students are expected to attend both sessions. All materials and tools will be provided. Visit www.artofthefold.com to learn more about Hedi Kyle, Ulla Warchol, and their new book.